The Codex Vaticanus was found on a shelf in a Vatican’s library in 1481, where it had been forgotten for centuries, its origin is unknown, & Codex Sinaiticus was found with many corrections all over the original in a wastebasket of a Catholic monastery in 1844. If it was considered trash before, why are we using it as part of our bibles today? Greek Bible scholar Frederik Scrivener said that Sinaiticus has thousands of changes that were made in the 6th and 7th centuries. An example of Sinaiticus’ many corrections. 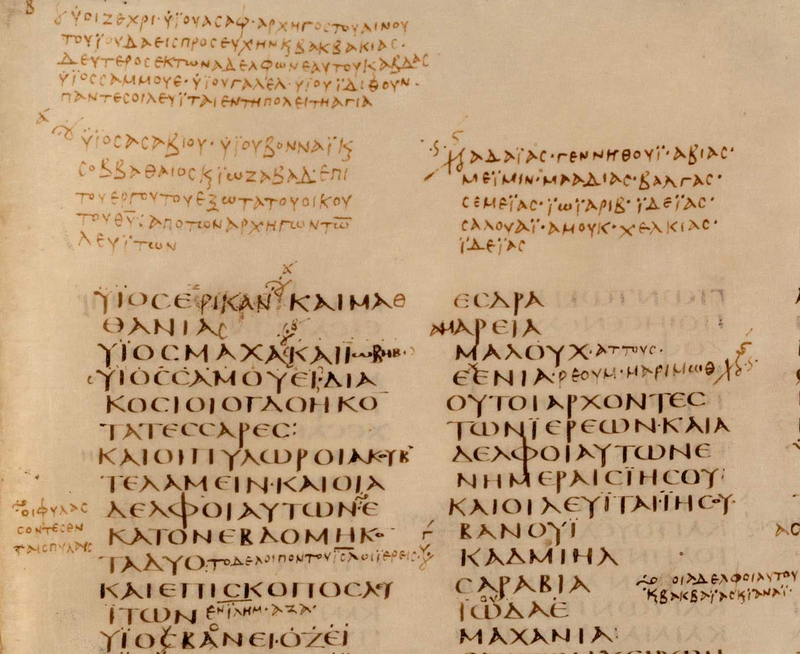 For thousands of years prior to this discovery of the Sinaiticus, Christians used the Majority Text or Textus Receptus bibles, but after this, two Cambridge professors Wescott & Hort decided to use the Alexandrian manuscripts in 1881 to make their Greek Interlinear, and now most if not all new modern translation use this Wescott & Hort interlinear (or use its copy , the 1898 Nestle-Aland/United Bible Society (NA/UBS) Greek text, with 27 revisions), to translate their own versions. It is important to note that in 1965 the United Bible Society (UBS) & the Roman Catholic Church agreed to prepare a ‘common (vulgate) text’ of the bible & adopted the ‘Westcott & Hort’ Greek interlinear. The UBS which distributes 80% of the bibles in the world, from its very beginnings has been cooperating with the Vatican, but today even more ( https://www.unitedbiblesocieties.org/united-bible-societies-welcomes-pope-francis/ ). Please also check: The United Bible Societies & Rome. Brooke Foss Westcott (1825–1901) was an Anglican bishop and a professor at Cambridge University & Fenton John Anthony Hort (1828–1892) also an Anglican Cambridge University Professor, they both were considered ‘mystics’ by many of their contemporaries. In order to know more about them we have their writings & both of them wrote extensively. We have also biographies of both men written by their sons. In 1896, Hort’s son Arthur F. Hort published a collection of Hort’s letters in two volumes. The book named “Life and Letters of Fenton John Anthony Hort” & in 1903 Arthur Westcott (Westcott’s son) published his fathers letters also in a two volume book entitled, “Life and Letters of Brooke Foss Westcott.” Did Westcott & Hort hold to the foundational doctrines of Christianity such as the inspiration of Scripture and the blood atonement of Christ? We found they did not. They founded several societies, two of which were ‘The Hermes Club‘ (Hermes is the Greek god conductor of souls to the underground). Their favor for Gnosticism & Catholic doctrines were evident in their lives & writings. They believed in purgatory, sacraments (sacred rites), prayers for the dead, worship of Mary, etc. For more information on their beliefs you can go to: Who Were Westcott & Hort?, Westcott & Hort, & Who Were Westcott & Hort & their beliefs. The Sinaiticus contains 2 non-canonical books, the Epistle of Barnabas & part of Sheperd of Hermas, both are Gnostic literature, Sheperd of Hermas is a work identified by occultist H. P. Blavatsky as a “kabbalistic” text! She ridiculed Anglican bishop, B.F. Westcott, for referring to it as a Christian writing. This have been confirmed by other esoteric & kabbalistic writers. Gnosticism refers to a heretic movement that threatened the early church in the 2nd century. Unfortunately many Christians think that it’s something of the past, not realizing the problem & infiltration of Gnosticsm in the Church is real today & even greater. The biblical apostles considered the Gnostics false teachers, but today many of them call themselves scholars, apostles, pastors & bible teachers, and sadly thousands of Christians embraced them and follow them without knowing. Gnosticism claims that hidden knowledge leads to salvation, that only a small or special group of people (elitist) posses, it refers to knowledge based on personal experience or perception. They believe that the world (or matter, flesh) is evil and that only the spirit is good, for that reason Jesus couldn’t be Divine. Gnostics were divided on Jesus. One view (the most common ) contended that a divine spirit (named Christ) came upon the body of Jesus, a regular human, at baptism and departed before his crucifixion (Kenosis) in other word Jesus is not 100% God & 100% men. This exactly is what the Shepherd of Hermas teaches, among other things. That Jesus was an ordinary man, not God in the flesh, (for that reason he couldn’t be worshiped), born of Mary and Joseph; and that at his baptism the spirit or ‘the Christ‘ descended upon Jesus and before or at his crucifixion the ‘Christ’ spirit departed, leaving the man Jesus to suffer alone. This is the real reason behind many bible verses changes, to accommodate these gnostic doctrines!! Luke 2:33 KJV – And Joseph and his mother marvelled at those things which were spoken of him. => ESV ‘And his father and his mother marveled at what was said about him.‘ – (ESV indicates that Jesus was born of an earthly father Joseph. Also see Luke 2:43. These alterations deny the role of the Holy Spirit in the conception of Jesus Christ and, therefore, His Divine nature). Luke 4:4 KJV – And Jesus answered him, saying, It is written, That man shall not live by bread alone, but by every word of God. => ESV ‘And Jesus answered him, “It is written, ‘Man shall not live by bread alone. (_________). (This undermine the authority of Scriptures, as they were not needed to sustain our daily spiritual life). Because for Gnostics Jesus is just a man and ‘Christ’ is the divinity (a spirit) that wasn’t always with him, then ESV removes the word ‘Christ’ or ‘Lord’ or son of God many times: Luke 21:8; John 4:42, 6:69; Matt.13:51; Acts 15:11; Rom. 1:3, 16, 10:17, 14:10; 1 Cor.5:4, 9:1, 16:22,-23, 2 Cor.11:31, Gal. 3:17, etc. etc. When the apostle Paul wrote that “in him dwells All the fullness of the deity bodily” Col.2:9 it was a rebuttal against the Gnostics. More info: Theopedia, Let us Reason .